Smokin' Aces is a 2006 British-American action comedy film written and directed by Joe Carnahan. The film centers on the chase for Las Vegas magician turned mafia informant Buddy "Aces" Israel (Jeremy Piven), on whom a one million dollar bounty is placed. The ensemble cast includes Ryan Reynolds, Ben Affleck, Jason Bateman, Common, Andy García, Alicia Keys, Taraji P. Henson, Ray Liotta, Chris Pine, and Matthew Fox, all co-starring as the various individuals attempting to either capture or protect Israel. Smokin' Aces was the official acting debut of Keys and Common. The film is set in Lake Tahoe and was mainly filmed at MontBleu Resort Casino & Spa, called the "Nomad Casino". It received generally mixed reviews, and was a commercial success. It was followed by a 2010 prequel, Smokin' Aces 2: Assassins' Ball, directed by P.J. Pesce and produced and co-written by Carnahan. Las Vegas magician and wannabe gangster, Buddy "Aces" Israel (Jeremy Piven) is hiding out in a Lake Tahoe hotel penthouse with his entourage. His agent, Morris Mecklen (Curtis Armstrong), discusses a potential immunity deal with FBI Deputy Director Stanley Locke (Andy Garcia). Agents Richard Messner (Ryan Reynolds) and Donald Carruthers (Ray Liotta) learn that ailing Las Vegas mob boss Primo Sparazza (Joseph Ruskin) has issued a bounty on Israel worth one million dollars, and involving a mysterious assassin known only as The Swede, stipulating that he will bring Sparazza Israel's heart. A number of assassins also seek the reward, including Lazlo Soot (Tommy Flanagan), who specializes in disguises and impersonations; Sharice Watters (Taraji P. Henson) and Georgia Sykes (Alicia Keys), two hitwomen hired by Sparazza's underboss; Pasquale Acosta (Nestor Carbonell), a calm torture expert and mercenary; and the psychotic neo-Nazi Tremor brothers, Darwin (Chris Pine), Jeeves (Kevin Durand), and Lester (Maury Sterling). Locke dispatches Messner and Carruthers to take Israel into custody when the deal is struck. Meanwhile, a team of bail bondsmen, Jack Dupree (Ben Affleck) and his partners, "Pistol" Pete Deeks (Peter Berg) and Hollis Elmore (Martin Henderson) have been hired by the firm that posted Israel's bail to bring him into custody. The bondsmen are attacked by the Tremors, and only Elmore escapes alive. Messner is dispatched to the murder scene while Carruthers proceeds to Israel. At the same time, each of the assassins gain access to the hotel in their own various ways. Carruthers encounters Acosta, disguised as a security officer, in an elevator at the hotel. Carruthers senses something is wrong and both are mortally wounded in a gunfight. Meanwhile, Soot gains access to the penthouse by posing as one of Israel's henchmen. Israel's second-in-command, Sir Ivy (Common), learns that Israel agreed to inform upon Ivy as part of the plea deal and attempts to kill him, but Israel injures Ivy long enough for the hotel security team to restrain Ivy. Georgia finds Carruthers and Acosta in the elevator, but assumes Acosta is Soot. In Los Angeles, Locke abruptly withdraws from the deal with Israel and orders that Messner and Carruthers are not told. The Tremor brothers reach the penthouse floor, where they engage in a shootout with the security team and Ivy, who manages to kill Jeeves and Lester. Israel, learning of the FBI's new position, attempts suicide. Messner arrives at the hotel and sets up a position around Georgia's elevator. Sharice provides cover from another hotel with a .50-caliber, M82 sniper rifle, outgunning the FBI agents. Acosta, still alive, shoots Georgia, but is shot by Carruthers. Sharice, thinking Georgia is dead, refuses to escape and keeps shooting at the FBI team. Georgia escapes to the penthouse, where she stops Darwin Tremor before he can kill Ivy. Tremor escapes, and Messner, distraught over the death of Carruthers, stops Ivy and Georgia on the stairwell, but lets them escape. Sharice, after seeing the pair alive and free through her rifle scope, is gunned down by the FBI. Locke and a team of FBI agents descend on the penthouse and take Israel to the hospital, while Soot escapes by tearing off his disguise & dressing as a member of hotel security. Acosta, carted away on a gurney, is also shown to be alive. Darwin Tremor tries to escape, but is gunned down by Hollis Elmore. Messner arrives at the hospital and learns the truth about the day's events from Locke. It transpires that the mysterious Swede is a prominent heart surgeon and that Soot was hired by Sparazza to get Israel's heart so it could be transplanted into the body of Sparazza. Sparazza is further revealed to be Freeman Heller (Mike Falkow), an FBI agent who went undercover and was thought to have been killed by the mob. The FBI had attempted to kill Heller, after they thought his assignment had blurred the lines between being a mobster or an FBI agent. But Heller survived and ended up taking on the role as Sparazza full-time. The mobster has agreed to expose the mob's operations in exchange for Israel's heart as he is Sparazza's love child and, thus, the most compatible donor. Messner, furious over the unnecessary deaths, especially Carruthers', protests and is ordered by Locke to leave the hospital and go home to Washington, D.C, as he is no longer on the case. Realizing that the FBI will never admit what they did, he walks into the emergency room, locks the door and pulls the plug on both Israel and Sparazza, killing them both. He then lays his gun and badge on the floor, while Locke and his men desperately try to break in, apparently resigning as an FBI agent. Ben Affleck as Jack Dupree: A world-weary Las Vegas bail bondsman who is hired to bring Buddy Israel back from Lake Tahoe and see that he makes his next court appearance. Chris Pine as Darwin Tremor: The eldest of the Tremor brothers, a trio of redneck, speed-freak, neo-Nazi skinhead hitmen with a penchant for scorched earth tactics. They get wind of the hit on Israel and decide to horn in on the action. Common as Sir Ivy: Israel's head of security. Tommy Flanagan as Lazlo Soot: A legendary Hungarian hitman and master of disguise who wears realistic latex masks. He agrees to kill Israel and bring his heart to Sparazza. Joseph Ruskin as Primo Sparazza, Las Vegas mob boss. Alicia Keys as Georgia Sykes: A female contract killer. She and her partner, Sharice Watters, are hired by Serna to abduct Israel from his hotel before Soot can kill him. Taraji P. Henson as Sharice Watters: A female contract killer and the partner of Georgia Sykes. She’s an outspoken feminist and a lesbian. Nestor Carbonell as Pasquale "The Plague" Acosta: A Spanish mercenary notorious for both his love of torture and his having chewed off his own fingertips while in SAS custody to avoid identification by Interpol. He learns of the contract on Israel and tries to collect on it himself. Kevin Durand as Jeeves Tremor: The largest and youngest of the Tremor brothers. Maury Sterling as Lester Tremor: The smallest of the Tremor brothers. Jason Bateman as Ripley "Rip" Reed: An insecure, disheveled, and perverse attorney with any number of paraphilias and addictions. His law firm bailed Israel out of jail, so he hires three bounty hunters to get him back before he officially jumps and they forfeit the bond. Vladimir Kulich as The Swede: Feared to be an mysterious assassin, but is actually a renowned heart surgeon. Peter Berg as "Pistol" Pete Deeks: A former Las Vegas vice cop fired from the force for corruption. He and his partner Hollis are hired by Dupree to help him recover Israel. Martin Henderson as Hollis Elmore: A former Las Vegas vice cop and the partner of Pistol Pete. He was not corrupt, but took the fall anyway for sticking with Pete. Joel Edgerton as Hugo Croop: An Eastern European bodyguard and hanger-on. Christopher Michael Holley as Beanie: Israel's favorite procurer. It is revealed in Smokin' Aces 2: Assassins' Ball that "Beanie" is actually an alias. His real name is Malcolm Little, and he is an undercover FBI agent. Matthew Fox as Bill: The head of security at the Lake Tahoe hotel where much of the action occurs. Wayne Newton makes a cameo appearance as himself. Joe Carnahan, the film's writer-director, makes a cameo as an armed robber at the beginning of the film. During the making of the film, Joe Carnahan's on-set photographer captured thousands of stills. These stills (over 3000) were given to the London-based studio VooDooDog, who found sequential photographs that could be animated into title sequences. The images were then manipulated using After Effects giving control of camera movement and depth of field. The sequence takes inspirations from Butch Cassidy and the Sundance Kid and other 1970's movies. To give the rostrum type hand made feel, ink textures were filmed using a Canon 5D stills camera. Originally two sequences were produced, an opening sequence and end sequence. However, only the end sequence was used. "Yes, Joe liked the opening credits we did but after their edit they felt it slowed the momentum of the introduction. That seems to be a big concern for filmmakers now – they’re aware of the short attention span of audiences and don’t want to delay the story. As a designer, I am not sure I would agree, of course. I think that if credit sequences are good and entertaining, they can hold an audience’s attention". The movie itself contains 18 songs, leaving only 1 out of the official soundtrack which was "Spottieottiedopaliscious" by Outkast. The score music was composed by Clint Mansell who has also scored such movies as The Fountain and Requiem for a Dream. According to Box Office Mojo, the movie grossed $14,638,755 on its opening weekend (2,218 theaters, averaging $6,599 per theater). The movie grossed a total of $35,662,731 in the North American market and $21,600,709 outside the United States, making a total worldwide gross of $57,263,440. Smokin' Aces has an approval rating of 30% on Rotten Tomatoes, based on 159 reviews, with an average score of 4.4/10. The site's critical consensus reads, "A violent mess of a movie, Smokin' Aces has some of Quentin Tarantino's style but not much of his wit or humor". On Metacritic, the film has a score of 45 out of 100, based on 32 critics, indicating "mixed or average reviews". The film received praise for its cast, action sequences, and soundtrack, and criticism for its storylines and violence. David Denby of The New Yorker gave a negative review of the film, stating that it has "a rabid, itchy, crack-den heartlessness to it—screw-you nihilism as a joke" and "has been made with the kind of antic violence that wins a movie the honorific title of “black comedy.” What that indicates in this case is that nothing makes sense—and that’s supposed to be cool." Peter Travers of Rolling Stone gave the film three out of four stars; although he noted that the film has "too many characters and too many plot strands" as well as an abrupt ending, he stated that the film is "shamelessly and unapologetically a guy movie... Carnahan can still fire up action and laughs like nobody's business." During a rare talk session for Princeton University's series of film screenings in October 2016, director Terrence Malick praised the film, stating that it was "very well directed" and impressive in how it was able to balance numerous plotlines. 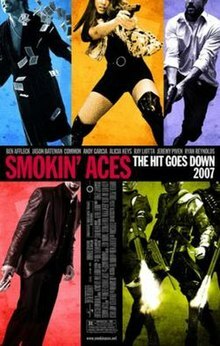 Smokin' Aces was released on DVD on April 17, 2007 and sold 1,853,397 DVD units which produced a revenue of $35,714,831, or more than double the movie's budget. On July 17, 2007, director Joe Carnahan announced that production had been approved by Universal Pictures for a second Smokin' Aces film, which he would not direct. The film is a prequel to the original and was released straight to DVD on January 19, 2010. Three actors in the movie were part of the main cast of the series Lost : Matthew Fox (Jack Shephard), Nestor Carbonell (Richard Alpert) and Kevin Durand (Martin Keamy) who had not yet appeared in the show when the movie was released (he would join the cast about a year later for its fourth season). ^ "Smokin' Aces (2007) - Financial Information". The-numbers.com. Retrieved 22 November 2017. ^ a b "Smokin' Aces (2007) - Financial Information". The Numbers. Retrieved February 20, 2018. ^ Donnellon, Paul (1 May 2012). "Smokin' Aces (2006)" (Interview). Interviewed by Ian Albinson. London. Retrieved July 19, 2012. ^ "Smokin' Aces ". what-song. Retrieved 2010-07-10. ^ "Smokin' Aces". Metacritic. Retrieved July 17, 2018. ^ Denby, David (January 22, 2007). "Crime Scenes". The New Yorker. Archived from the original on February 3, 2007. Retrieved July 17, 2018. ^ Travis, Peter (January 24, 2007). "Smokin' Aces". Rolling Stone. Archived from the original on February 2, 2007. Retrieved July 17, 2018. ^ "Terrence Malick Talks Filmmaking and His Future in Rare Live Appearance". The Film Stage. October 25, 2018. Retrieved July 17, 2018. ^ "Joe Carnahan says Smokin' Aces 2 Will be a Prequel". BeyondHollywood.com. 2007-07-20. Retrieved 2011-03-05. ^ Neoganda (2007-01-09). "Smokin' Joe Carnahan". Smokinjoecarnahan.com. Retrieved 2011-03-05.